The U.S. has the dubious honor of being the on again off again world leader in obesity throughout the 21st century. Mexico has only recently knocked us off our top spot. Obesity has grown from 13% of people in 1962 to 19.4% in 2003 to 35.7% in 2010. The most recent figures show a slight decrease in obesity: only 34.9%, or 78.6 million U.S. adults, are obese. Obesity-related illnesses have led to between 100,000 and 400,000 deaths per year in the U.S., depending on the statistics you read. Approximately $147B is spent on medical expenses for obesity-related diseases every year in the US—exceeding even the health care costs associated with smoking. Obesity is clearly a serious health epidemic. However, it is a particularly divisive one. While countless people struggle with obesity due to an underlying medical issue, it can also be caused by lifestyle and diet choices. These diet choices can also be essentially forced on a person through food deserts, areas with little access to fresh food, limiting the availability and affordability of healthier food options. This dichotomy has left the courts struggling to agree on an approach to obesity under the Americans With Disabilities Act (ADA)—the act which provides federal protection against discrimination based on a disability. Is obesity a disability? How do we approach providing legal protection to people based on something that could be the product of potentially changeable behaviors? In order to discuss obesity, we’ll first need to define exactly what it is. 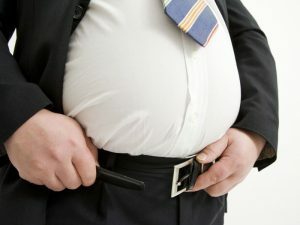 The American Medical Association (AMA) has classified obesity and morbid obesity as diseases. The AMA defines a disease as something which incorporates 1) an impairment of the normal functioning of some aspect of the body; 2) characteristic signs or symptoms; and 3) harm or morbidity. While this isn’t a legally binding holding, it is persuasive and underscores how dangerous widespread obesity is as an epidemic. Obesity is distinct from being overweight. While overweight is defined as simply being over a weight that is set for your height and bone structure, obesity requires having a body mass index (a comparison of your height to your weight) greater than 30. To put that in context, the average healthy person has a BMI of 18.5-25. Morbid obesity is defined as either having a body mass index of 40 or more, being greater than 100 pounds over the average weight for your height, or a body mass index of 35 or higher coupled with serious obesity-related medical complications. Up until 2008, the ADA did not cover obesity unless there was a proven underlying medical cause. Some courts considered morbid obesity as a disability regardless of cause, but obesity without an associated medical condition basically never got the nod. However, new amendments to the ADA in 2008 under the particularly hard to say ADAAA have changed the analysis of obesity by requiring that the term “disability” be provided a broader reading by the courts. The ADA now defines disability as a person who has one of three things: a physical or mental impairment which substantially limits one or more major life activities, a history or record of such an impairment, or is perceived by others as having such an impairment. The amendments also broadened the interpretation of “substantially limits” to require less, forbad the consideration of mitigating measures that could be taken in the analysis of a disability, expanded the definition of “major life activities,” and provided a non-exhaustive list of such activities which included caring for oneself, performing manual tasks, seeing, hearing, eating, sleeping, walking, standing, lifting, bending, speaking, breathing, learning, reading, concentrating, thinking, communicating and working. These changes have made it much more likely that obesity, regardless of cause, is a protected disability under the ADA. The fact that mitigating measures that could be taken are not considered, coupled with the fact that obesity likely substantially limits many of the enumerated major life activities. What’s more, a discrimination claim under the ADA now only requires a showing that a person’s been subject to adverse employment action (eg. fired or refused a promotion) because their employer perceives that they have a physical or mental impairment—regardless of whether they have an actual disability covered by the ADA or whether their impairment actually limits a major life activity. However, this type of discrimination can be awfully hard to prove without a smoking gun email or letter as it mostly concerns the mental state of an employer. The Equal Employment Opportunity Commission (EEOC) certainly has decided that the changes mean that obesity is a disability, regardless of cause. After the ADAAA, the EEOC stated that, based on their guidelines, all obesity and morbid obesity are considered disabilities which can be subject to disability discrimination. Since the changes, case law has been relatively sparse on the issue. However, recent cases are mixed in their approach. A number of rulings since the ADAAA, including decisions as recent as 2010, 2012 and 2014 have held that obesity can be a disability, regardless of voluntariness. This being said, earlier this very year the 8th Circuit Appeals Court held that all obesity—including morbid obesity—can only be considered a disability if there is an underlying medical issue. While some courts still seem reticent towards broad recognition of obesity as a disability, arguing the impracticality of declaring a third of the population disabled and that the actual disability of obesity is the underlying medical cause, the trend seems to be towards recognizing all obesity as a disability under the ADA. At the very least, it has reached the point where it would behoove employers to take steps to ensure they make reasonable accommodations—any accommodation that would not cause undue burden to the employer—for their obese employees.